Durak is an Orc ranger and a vampire hunter. He is the first to approach you about the recent vampire menace and recruits you into the Dawnguard. If you speak with him in Dayspring Canyon, he will give you a crossbow and 45 steel bolts. 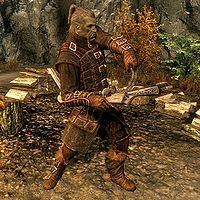 He will tell you that the crossbow is a "Dawnguard specialty" and is the best weapon to use when trying to take down vampires. Durak will be available as a follower once the quest Prophet is completed. He is one of the few followers who has no maximum level. He will continue to level up with you. He wears a set of Dawnguard armor, including matching pairs of gauntlets and boots. He is equipped with a Dawnguard war axe and a Dawnguard shield. He will switch to a crossbow supplemented with 14 steel bolts for long range attacks should the need arise. Sometimes Durak will randomly be hostile towards the player without provocation. This page was last modified on 3 May 2018, at 05:08.